Dallying In The Dirt, Issue #147 --- I discover fairy gardening. I cut back all but one of the Tuberous Begonias. The very best looking one I watered and have left to see just how late into the season it is going to be before we get that killing frost. I’ve never made the first of November before, so we are trying for a record. Lots of other autumn activities are keeping us out in the garden as the weather cools but stays mostly sunny. The massive Walnut tree continues to drop its fruit from great heights. They hit the pond like depth charges or smash their hard shells on the boards of the new deck. I grimace as each one hits, smashes and leaves behind the inevitable dark stain on my shiny new wood. It was getting difficult to walk across the deck so I had to gather them up. This is a dangerous occupation. Being out there, under that tree, requires same strange gardening attire. I hope I never need the hard hat but these 5cm green bombs have landed close to me and it’s a touch scary. 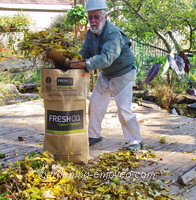 All of the leaves and the fruit go into the municipal composting bags and head for the street, as I don’t want them in my own compost. It uses a lot of bags. Three layers of walnuts in the bottom of the bag comes close to its weight limit. Add some leaves and it’s done. Scattered throughout the vegetable garden this year, I had a selection of different types of Gladiolus. They grew well but the flowers were a bit disappointing. 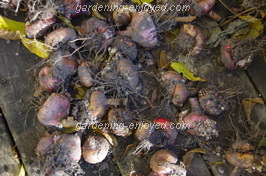 Nonetheless, as I clean up that garden, I dig up some nice large Gladiolus corms and have to decide what to do with them. Toss them out and buy new ones next year is the easy choice but gardeners, particularly frugal gardeners like me, find that a very difficult choice to make. I really don’t need anything else to overwinter but somehow I just can’t seem to toss perfectly good corms. They were set out to dry and now I will remove the excess dirt and all of the little developing corms and store them until next year. I have had Glads overwinter in my garden, by mistake of course, but it was interesting to see them come up the next spring. I will not keep all the tiny developing corms and line them out to grow into bigger ones next year. Yesterday I attended the “Garden & Floral Expo” put on by the trade association Landscape Ontario. This is a show for the trade, that showcases all of the new and exciting things that you may see in your garden centres next spring. 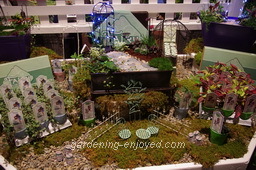 I was made to feel like a very old, out of touch person when I discovered that I didn’t know what “Fairy Gardening” was. Apparently this is a big and booming hobby. Whole kits filled with containers and soil and furniture are available and then a wide selection of miniature plants are purchased to make the garden. It’s a great way to get children interested in gardening but it is also a touted as the perfect way to satisfy your gardening urges when you live in a location where an outdoor garden is unavailable. To me, it has the look of a great bit of marketing and one of those ideas, that I wish, that I had thought of. The miniature furniture and paving stones and bird baths etc. can, at some cost, create delightful little gardens when mixed with the tiny plants that are part of this scheme. I thought that more emphasis or information should be made obvious about the need for one critical element, sufficient light to let those plants thrive. Every person has their hobby and this one is apparently taking off. Sandra Asks? I am new at growing asparagus. Should I cut it back in the fall or just leave it as is until spring. It has grown to about 4ft. high this year. Thanks for your help. Ken Answers! I cut my back to ground level in the fall, as soon as it starts to turn yellow or on any warm sunny day now. Sue Asks? My question for you is that my neighbour and I had several beautiful bee balm plants which disappeared this summer except for one or two. We know we didn't dig them up and wonder what could have happened. We had them for 4 or 5 years before they disappeared. Ken Answers! Many more people complain about their Bee Balm,(Monarda spp.) taking over their garden than having it disappear. If sections of your planting grew early in the season and then disappeared mid season, fear not as I'm sure it will return with vigor in the spring. If entire plants never did appear this year then I'm at a loss to guess to what might have been the cause. Inhospitable conditions, mole/vole attack over the winter. There are several possibilities. Dan Asks? I usually wait till early / mid November after a hard frost to dig up and dry my Calla Lilies before I put them in the basement. With the wet October we are having do you think it is to early to dig them up? Ken Answers! It's always interesting dealing with readers from a wide climate range. On a normal year I would have had a frost, killing my Callas, before now and you are anticipating mid November. We have not yet had that frost and I have dug and moved to the basement, almost all of my tender bulbs. There is no horticultural reason to wait for the frost, it's just we gardeners desire to squeeze every last day into the gardening season. Go ahead and dig.